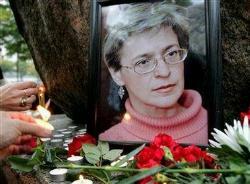 Crusading journalist Anna Politkovskaya, 48, who was gunned down by an unknown assailant in the entrance to her apartment building on Saturday, was buried today in Moscow as thousand of reporters, human rights advocates and regular citizens turned out in the rain to pay their last respects. President Vladimir Putin, meanwhile, broke a three-day silence on Politkovskaya’s death and called her role in Russian political life "insignificant" in an interview with a German newspaper. Crowds began to gather outside the Troyekurovskoye cemetery on the outskirts of Moscow early in the drizzly day – a testimony to her almost movie-star status among Russian journalists and human rights defenders. The entrance to Politkovskaya’s apartment building had on Sunday and Monday become a makeshift shrine, as well wishers laid flowers by her photograph, and Russia’s main newspapers ran pictures of her on their front pages. Colleagues at her newspaper, the liberal biweekly Novaya Gazeta, published a special issue promising that "her killers will not sleep soundly." After making their official remarks and observing a minute of silence for Politkovskaya, Engensland, Austenå and Norway’s Amnesty International head, Petter Eide, set out across the street to deliver a note to the Russian Embassy imploring the Russian government to carry out a fair and unbiased investigation to bring Politkovskaya’s killer to justice. They were briefly hindered by police, but were let in through the Embassy’s iron gates where they hand-delivered the message to a diplomatic assistant. Others gathered in the crowd represented Oslo journalistic and literary establishment, the human rights sector, and members of the Russian and Chechen diaspora. One elderly Chechen woman, who could barely speak as she choked back tears, told Bellona Web she had been “more than a relative” of Politkovskaya. Asking that her name not be used, she related that her son, who had been captured and brutalized by Russian forces, became an ongoing subject of Politkovskaya’s investigations. Parolin’s area of specialisation at the Helsinki Committee is Chechnya, and Politkovskaya’s books, she said, were her main texts and chief source of inspiration. “I feel responsible to continue work on Chechnya,” she said. Anders Heger, an Oslo publisher, said as he drew on his pipe that he had met Politkovskaya several times in person and spoken with her extensively. “Mainly, this is a strike against freedom of expression in Russia,” he said. “We have to send an international message – but I don’t think they will listen. "